First off, I’d just like to thank godphillips for nominating us for this award. Check out his blog at http://worshipfulheart.wordpress.com/! Thank the blogger who gave you the award. Yep. Write up a post about it. Uh huh. Answer the questions below. Sure thing. 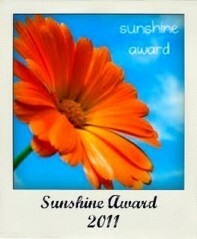 Pass it along to ten people and let them know they’ve received the award. Yessir. Put up the picture of the blog award. Done. 6. A [Bad] Poem A Day! Favorite Animal: Dogs. And Cats. Favorite Drink: Probably milk or orange juice. Facebook or Twitter: Facebook but I can do Twitter (@ogpoetry) as well. My Passions: Music, writting, obviously poetry and any kind of art. Getting or Giving Presents: Getting. Woah holy crap we won an award?? this is rad!! Follow us on Twitter too!! Original Poetry is now on Facebook!